With Mother's Day just around the corner, I wanted to put up an easy and fun gift tutorial from my new book which is entirely practical and features Mom's favorite beer. If your mom is anything like me, there are probably a couple cool looking cans sitting in her recycling bin right now just waiting to be upcycled. If not, you should go pick up her brand of choice and pour her a cold one. You could drink this beer yourself, but remember, this is the woman who gave you life, carried you around for nine month, wiped your runny nose, made sure you were wearing sensible shoes and gave you your good looks. Seriously, you should buy her a beer. 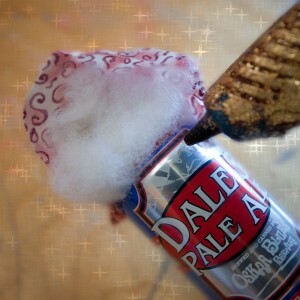 Open up the can of beer and drain it quickly. Use the can opener to remove the top from the can. Rinse and dry the can, being mindful of the cut edges. Fill the can about halfway with small rocks. Fill the remainder of the can with stuffing, leaving about 2 inches of stuffing coming out of the top of the can. Set aside an extra handful of stuffing for the last step. Cut a 7-inch circle from the fabric. Cut 1/2-inch slits in fabric every inch all the way around the fabric circle. Hot glue the edge of the fabric to the outside of the can. The slits you cut will help ease the fabric tension, but you’ll also want to let the fabric fold onto itself in creases as you glue it down. When you get halfway around the can, insert the rest of the stuffing. Finish gluing the fabric around the can. 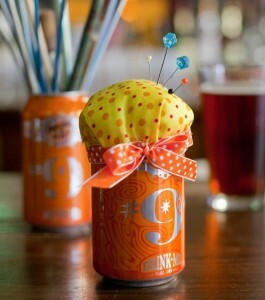 Put a bead of hot glue around the seam where the fabric meets the can, then place the ribbon on top of the glue beads. For 39 other cool crafts like this, check out my new book Beer Crafts available now for pre-order and on the shelves May 14th.